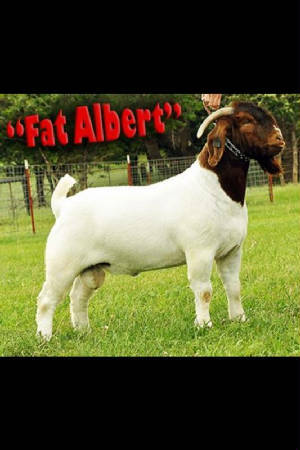 His kids have done it all from Grand Champion wethers to Grand Champion Does to Grand Champion Bucks. Double bred Mozart son! His level spin and square hip, EXTREME muscle, with a smooth front, extra sound made and that wether look that just has to be bred. Overall Grand Champion ABGA Show Percentage. 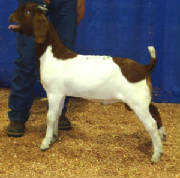 Doe, Overall Grand Fullblood Doe at the ABGA show, ABGA Grand Champion Buck Western Okla. Goat Classic. N.W. District Woodward: Div. Champion, Res. Div. Champion wether, Central District: Res. Div. Champion, Div. Champion, Res. 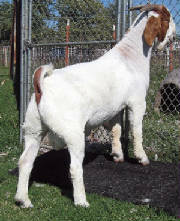 Grand Champion wether. 4 of the top 20 OYE Does, Bronzes Doe, Div. 3 Champion Doe and 2 more class winners. 2008 State Fair Res. Grand Doe and Res. Div Wether. Some say you can not make wethers and does from the same buck, this guy can get it done. Right click his photo to see his flush mate's and there winnings. Double 00, stout, powerful buck that is designed to perfection. Base width, center body capacity while keeping them shallow and great patterned. Smooth shoulder in addition to curvature through the rib cage that extends outside the shoulder. All that with a deep level hip. We call that a STUD buck we call him Double 00. His first Doe out Grand Champion Okla. State Fair, first wether Res. Div. Champion Tulsa State Fair. Another Div. Champion Doe at the Tulsa State Fair both out of the same doe. Double Take, Partnership with Jamie Booth. Our thanks to Dr. Gary Vannoy of Ozona, Tx for turning this guy lose. 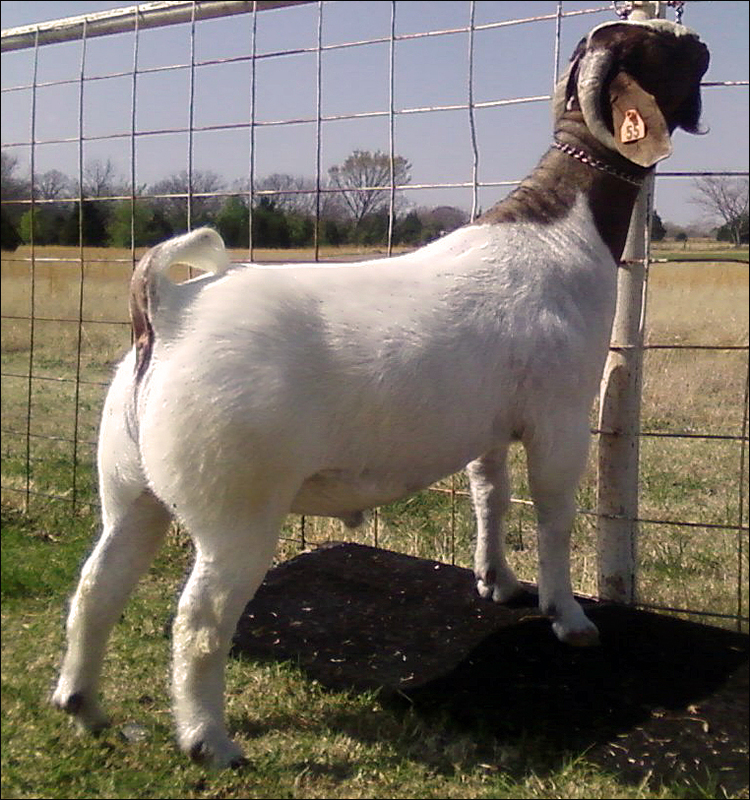 When we found out he had him at the Texas Wether Buck & Doe Sale, we knew we had to have him. 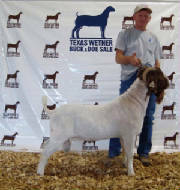 SMOKE HOUSE is a full brother to Crockett, Crockett has made as many champion wethers as any buck out there. 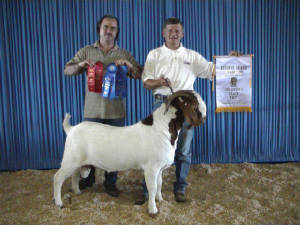 First for Glyn Hutto and now for Hudson Show Goats ( www.championgoats.com ). Judge: Preston Faris called him one of the hardest muscled bucks of the show. . He is cool fronted, shallow chested,long sided, and powerful. 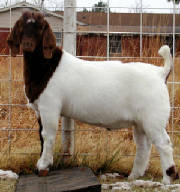 He is a beautifully balanced wether sire that is sure to produce some great ones. He has the look that wins shows! This guy has wether buck all over him, with the look and the feel. He has the breeding of Norman Kohls and York. 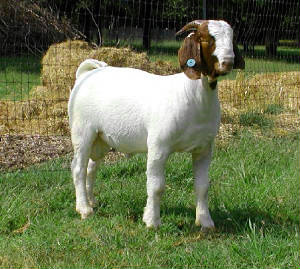 He is a NMK over a double breed CEO doe pedigree full of *Ennobled* goats but what we like about him is he has a pedigree full of HARD muscled goats! We lost him this summer. We went out looking for a wether back that could take our goats to the next level. Here he is HOSS! I admire his powerful RACK shape and his unbelievable cool level hip. The substance of bone he adds is just another plus. On top of all that, believe it or not he is out of a solid red buck. 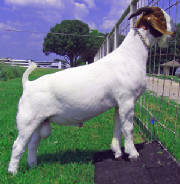 He is bread to be a great wether buck, with some of the top wether bucks in the country in his pedigree. Like Raff Boers Full Throttle, and Billy Rays dam she's is a Colt, you will find he gos back to Colt 3 times.